I stole this from Researcher@Large! The purpose of this pamphlet is to give gunnery officers and operating personnel a working acquaintance with the Mark 8 Radar. 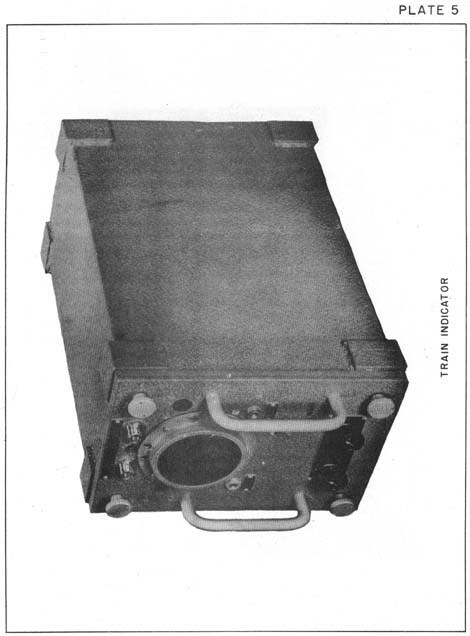 Little attention is given to strictly radio features since these are covered in the Instruction Book of the Mark 8, but it is a basic assumption that they are working satisfactorily. Emphasis is placed on the actual operation of the control units of the radar with a view to obtaining the best possible results from the equipment. 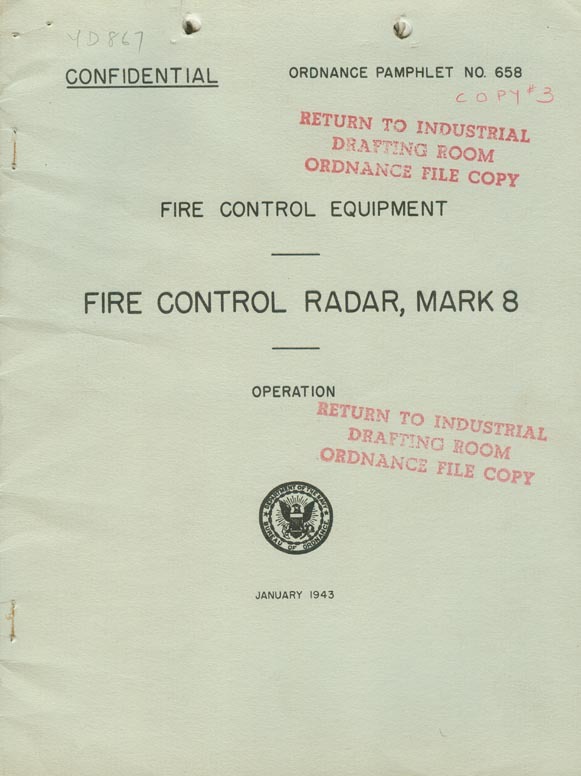 These instructions and notes have been prepared by the Bureau of Ordnance from the meager operating data available at the present time. It is expected that further service experience will disclose inaccuracies in this description and supply information of definite value in fire control operations. For these reasons, reports of operation, containing difficulties encountered and successful techniques employed, are urgently desired by the Bureau. The sooner these reports come in the sooner this pamphlet can be revised so as to give all concerned the advantage of such valuable experience. Reports may be submitted in official form or as informal notes prepared by operating personnel and forwarded by a brief letter of transmittal. 1. 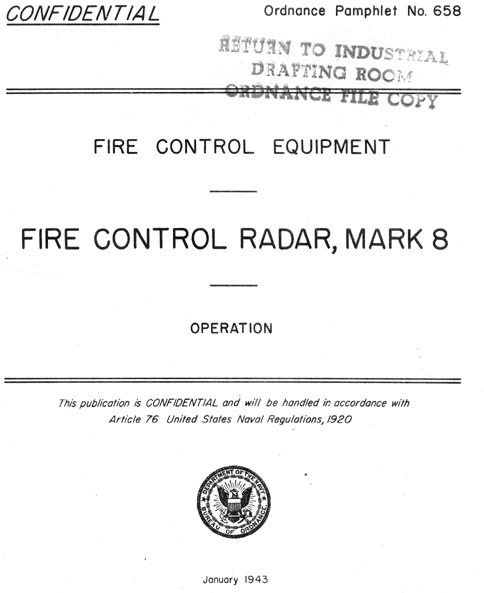 The Mark 8 Radar is a main battery fire control equipment designed for use with Mark 34 and Mark 38 directors. Briefly, its basic principle of operation is as follows: A narrow beam (6° vertically and 2° horizontally) of radio energy in the form of short pulses is radiated from a "polyrod" antenna. Upon striking an object some of this energy is reflected and an "echo" is picked up by the receiver. This echo is indicated on the screens of the indicators as either type A or type B scan. The operator then makes easy and rapid adjustments of the controls to obtain the range and bearing of the reflecting object. Range and bearing are transmitted to plot and used in the solution of the fire control problem. (a) Precision ranging to approximately 45,000 yards. (b) Range accuracy, using PREC (precision) sweep, approximately 15 yards plus or minus 0.1 percent of the measured range. Thus, for a range of 14,000 yards, the accuracy is approximately ± 29 yards. (c) Angular field of view for any given position of director: 30° total or ± 15° from center line of sight of antenna. (d) Bearing accuracy of 6' (or about 2 mils). 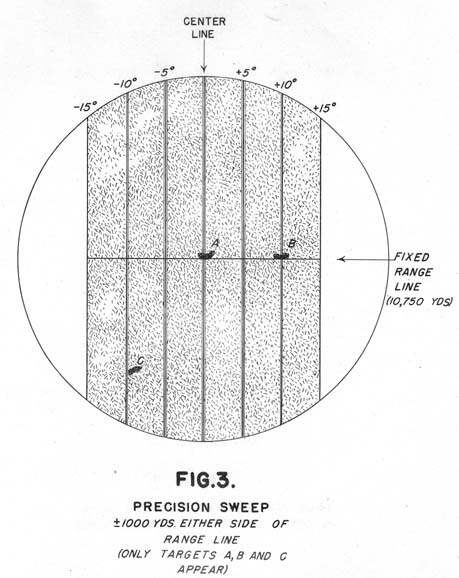 (e) Range resolution with PREC (precision) sweep: approximately 50 yards. In other words when two targets are on the same bearing a range difference of 50 yards will be barely sufficient to identify them as separate targets. differ by at least 2° if they are to be recognized instantaneously as separate targets. 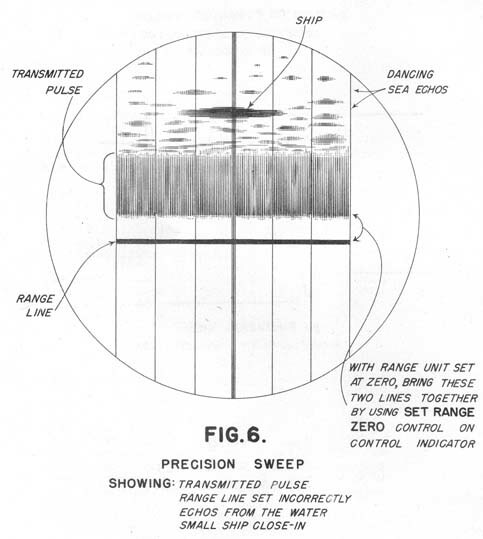 However, due to the selective fading phenomenon which is characteristic of two ships that roll independently, the number of targets which form a single trace on the screen can be determined by the different fading rates of different parts of the trace. (g) Indication of the presence of targets out to nearly 60,000 yards. Note carefully, however, that the Range Unit is effective to about 45,000 yards, only. (h) Minimum range of approximately 500 yards. 3. Before considering details of operation the operator should have a clear picture of the radar system as a whole and should know the names, locations and functions of the principal units of the equipment. The following brief outline, if studied carefully with the aid of the accompanying cutaway drawing of the Mark 38 Director (see pl. 1), should establish the interrelationship of the main parts of the apparatus and form a basis for an understanding of its effective operation. 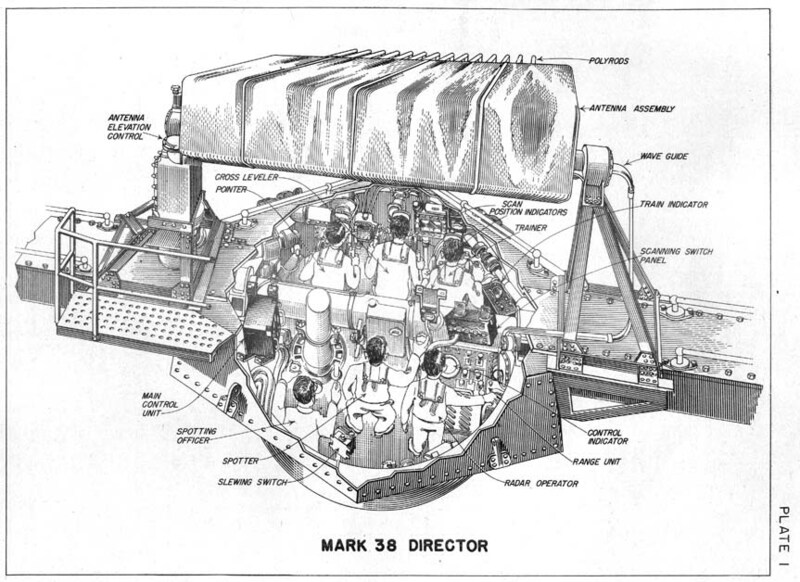 Positions noted in parentheses are for the Mark 38 Director, but in most cases also hold for the Mark 34 Director. 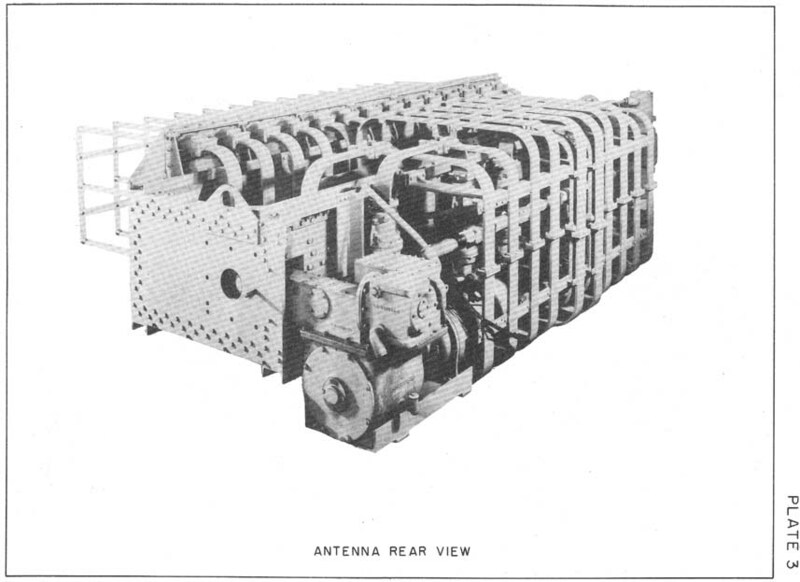 (a) Antenna assembly. - (On top of director, see pls. 2 and 3.) 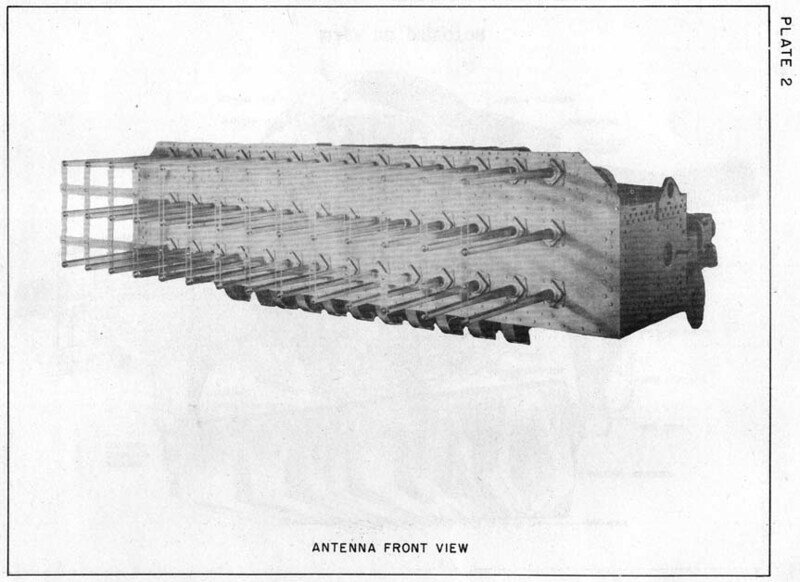 The antenna transmits radio pulses and receives their echoes. The associated scanning equipment enables the operator to scan a field of 30° out to about 60,000 yards. 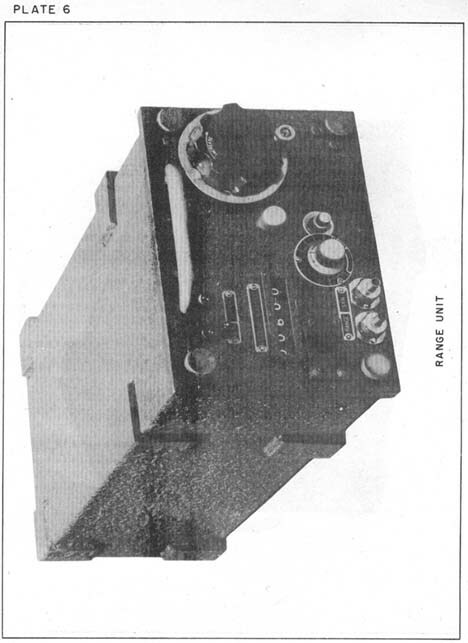 (b) Power control unit. - (Inside director.) 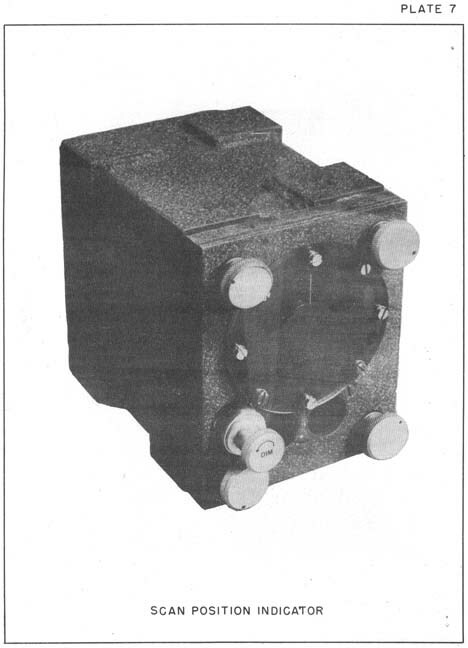 This unit is used for starting and stopping the Mark 8 Radar and for adjusting voltages. (c) Control indicator. - (Inside director, see pl. 4.) Commonly referred to as the C and I. This is the main control unit with 5" cathode ray screen. It also has switches for selecting types of scan or sweep and knobs for adjusting focus, intensity, etc. 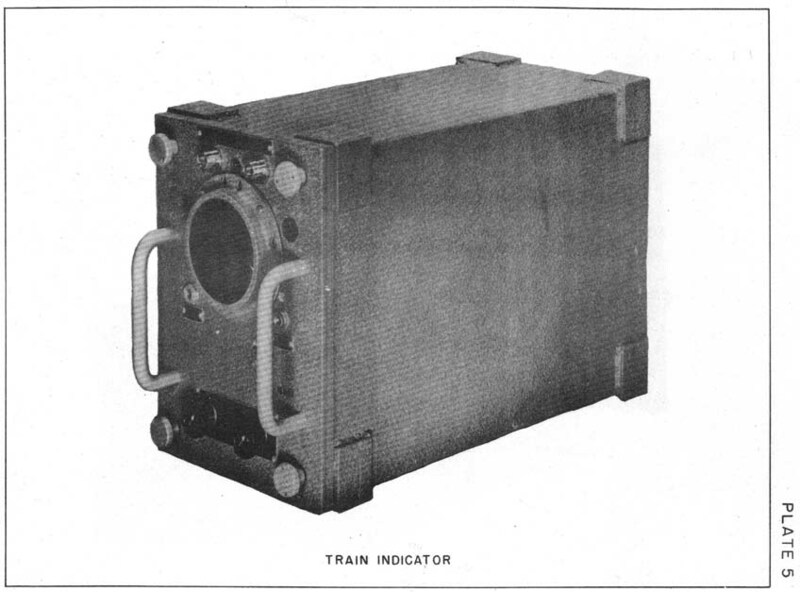 With the train indicator and the range unit (see below) the C and I is used to determine range and bearing of a target. (d) Train indicator. - (inside director, see pl. 5.) 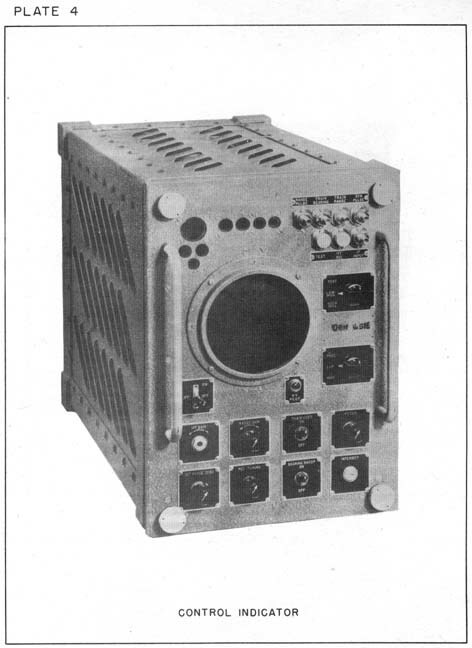 This unit has a 3" cathode ray screen and is used by the trainer in centering the director on the target. 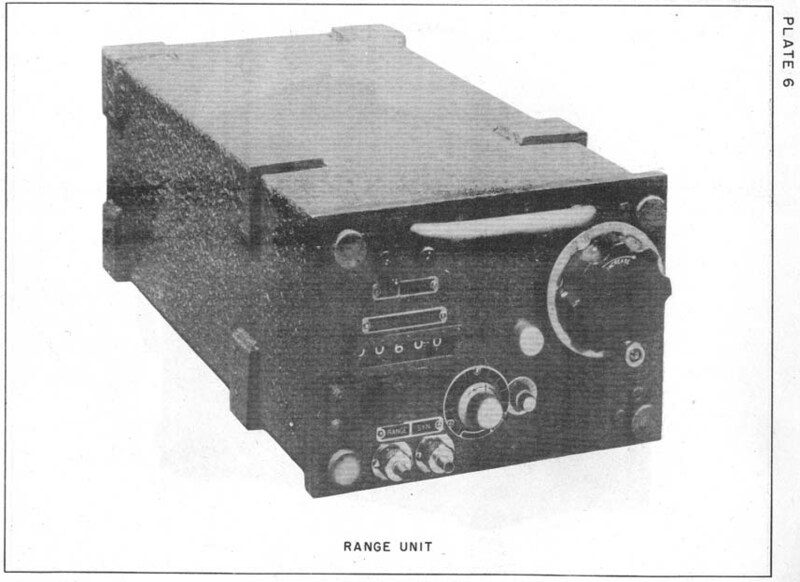 (e) Range unit. - (Inside director, see pl. 6.) 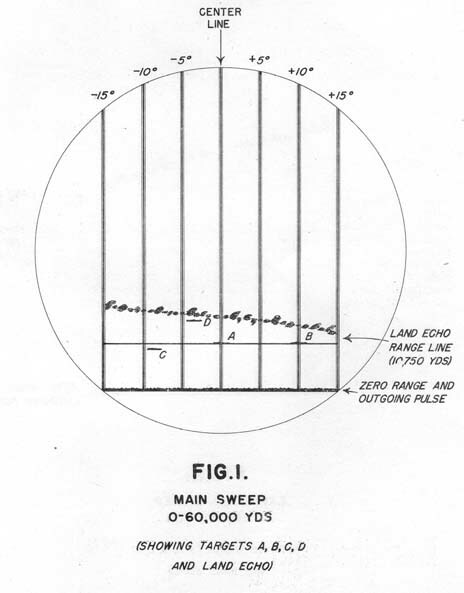 This unit shows the range of the target (in yards) on a Veeder type of counter. It is coupled to the Range Transmitter which transmits range to plot, when the range ring is pushed. (f) Scan position indicators. - (Inside director, see pl. 7.) For slow scanning these indicators show on dials the direction of the radiated beam with respect to the line of sight of the director. The dial reading is added to or subtracted from the bearing of the director in obtaining the bearing of the target. Dial readings are meaningless when operating at high speed scan. 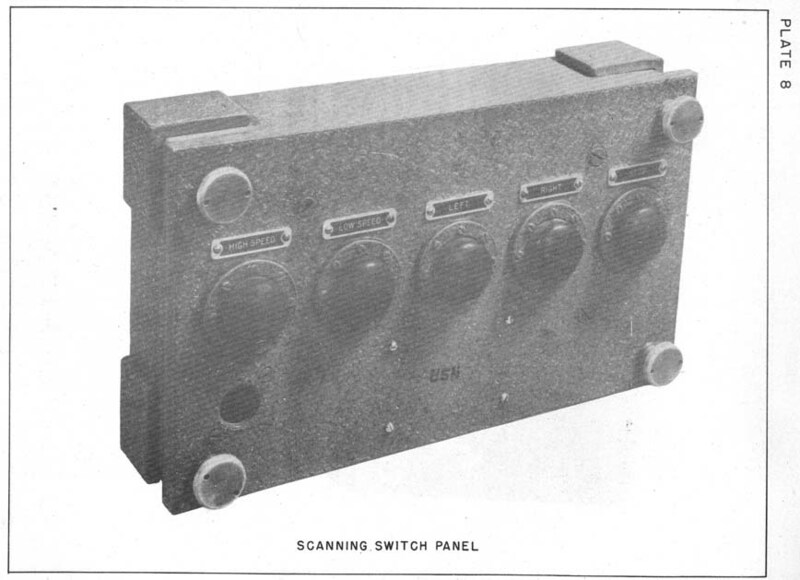 (g) Scanning switch panel. - (inside director, see pl. 8.) 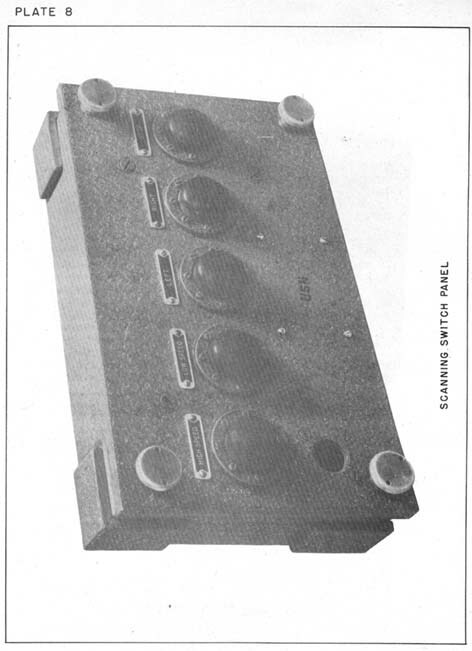 This panel has a set of push-button switches which control the type of scanning used. (i) Scanning motor controller. - (Under director.) The last two units are secured to the under side of the rotating part of the director. Their functions should be clear from their names. (a) High speed scan, in which a 30° sector of the horizon is covered at the rate of 10 times per second*. * In this scanning the antenna and director do not move from side to side through a 30-degree anglee but a motor in the antenna itself shifts the relative phases of the different radiators (or "polyrods") and thereby causes the beam to move back and forth. 6. In MAIN sweep the screens indicate ranges from 0 to 60,000 yards. In EXP sweep they go from 0 to 20,000 yards. In PREC sweep any range interval of 2000 yards may be indicated as long as the interval lies between 0 and about 45,000 yards. Figure 1 illustrates the appearance of the screens when the Radar is operating at High Speed Scan and with MAIN sweep. The heavy base line represents zero range and the thin line parallel to it is the Range Line. The Range Line can be moved to any position between 0 and 45,000 yards by turning a knob on the Range Unit. When the Range Line is on a target echo, as in figure 1, the range of that particular target is given on the counter on the Range Unit. The seven parallel lines mark off intervals of bearing, each interval representing a change of five degrees. The center trace gives the line of sight of the director. Echoes in the two outside 5° intervals cannot always be relied on (see paragraph on side lobes). As an example, suppose that the counter of the Range Unit reads 10,750 yards for the setting of the Range Line shown in figure 1. Then target A is at a range of 10,750 yards and at the bearing given by the director train angle. Target B is at the same range but its bearing is 10° to the right of the director train angle. Figure 1 showed the picture obtained with High Speed Scan - MAIN sweep. By turning the switch on the C and I to EXP (expanded sweep) the first 20,000 yards of range is expanded three times to completely fill the screen (see fig. 2). This gives a clearer picture when there are several targets within a range of 20,000 yards. 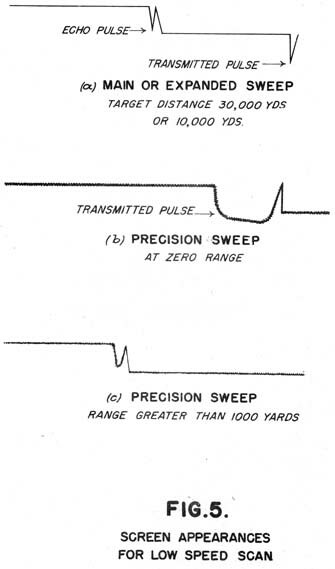 By a further turn of the switch to PREC (precision sweep) a 2000 yard range interval is expanded 10 times more (see fig. 3). The range line now remains fixed near the center of the screen and turning the range knob causes the targets to move across the field of view. With this precision sweep it is an easy matter to track a fast-moving surface target. Figures 1, 2 and 3 should be carefully compared. They give the screen appearances for the same set of targets at the same time. In addition, figure 4 may be helpful in visualizing the relation between the true layout of targets on the 30° sector of the horizon and their screen indications. In particular, note that target indications on the screens give the false impression that the ships are being "observed" broadside in every case. The shape of the target indication on the screen is not determined by the target angle but by the width of the beam and the amplitude of the echo. not be accurate unless the scanning is stopped when the pip is maximum size. Since this may be difficult to do, it is apparent that bearings taken at LOW SPEED will not be accurate as those taken at HIGH SPEED. Ranges, however, should be just as accurate. (1) Longer ranges, because the beam remains on the target for a greater length of time and many more pulses are received per second from a given target. This builds up a higher amplitude of received signal. (2) Less wear on the antenna scanning mechanism. 7. 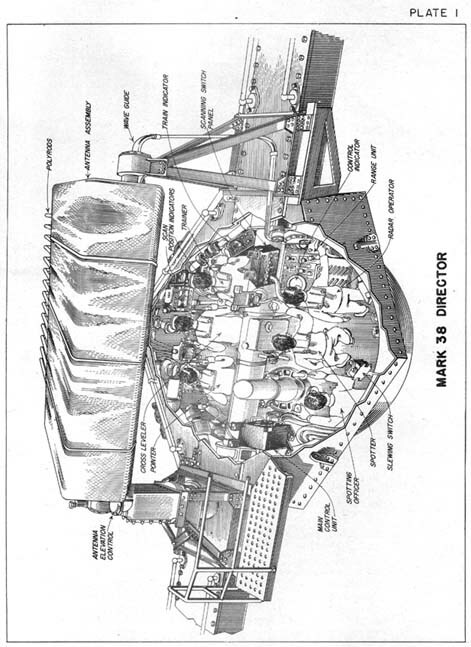 Insofar as handling the controls is concerned, the Mark 8 Radar is a simple apparatus. A few hours should be sufficient time to train a man in the proper working of the control switches, dials, etc. To become a skilled operator, however, is an entirely different matter. Many hours of careful practice and experience in "reading" the indicators will be necessary if targets are to be properly interpreted and accurately followed to long ranges. Work frequently with the equipment and think about what you see, and the chances are excellent that you will not be upset by unexpected situations. 8. The procedures for starting, running and stopping the Mark 8 Radar are given below. To avoid serious damage to the equipment PERFORM THESE OPERATIONS IN THE ORDER LISTED. This switch is below the green pilot light on the main control unit. This is done by means of the line voltage control knob on the main control unit. The value should be 120 volts. * Be certain, as here assumed, that the standby temperature-controlling power has been on for at least a half hour before making starting oper. ations. The equipment should also have been checked and tuned as described in the W.E. Instruction Book. This control knob is on the main control unit. Turn it all the way counterclockwise. This switch is below the red pilot light on the main control unit. Wait for this light to come on before performing operation (5). About one minute is usually required. The value of this voltage usually between .7 and 1.0 Kv should be specified by the Radar Officer and posted on a card over the HV meter. TURN SCAN SWITCH TO LOW SPEED. This switch is on the C and I. This button is on the scanning switch panel. A few seconds will elapse before the antenna scanning motor starts. However, the button need not be held in for this period. TURN SCAM SWITCH TO HIGH SPEED. TURN SWEEP SWITCH TO EXP. Use a screwdriver and turn until the image on the scope is of rather low intensity. The range and bearing lines should be in best focus (that is, sharpest). TURN SWEEP SWITCH TO PREC. Continue this operation until sea echoes appear. This knob is on the C and I. It should be turned down to a point where the strongest signals are just visible. The best adjustment gives strongest echoes. Stop when the counter reads the correction value* determined at the time of installation. Adjust this control knob until the transmitted pulse and range line just coincide. (See fig. 6.) PRECAUTION: Do not move this knob during operation since this would spoil the range accuracy. STEPS (17) and (18) SHOULD BE PERFORMED AT LEAST ONCE A DAY AND ALWAYS AFTER GUNFIRE. NOTE: Except for minor adjustments which may improve performance the equipment is now ready for measurements at High Speed Scan and PREC sweep. The series of operations above need not be repeated, however, if the operator wishes to use a different scan or sweep. Switches are provided on the Control Indicator and Scanning Switch Panel for quick changes from one type to another. However, IN SWITCHING FROM LOW SPEED TO HIGH SPEED or VICE VERSA ON THE SCANNING SWITCH PANEL TWO PRECAUTIONS should always be taken to avoid damage to the equipment. Make sure that SCAN SWITCH on C and I is on LOW SPEED. Always push STOP BUTTON ON SCANNING SWITCH PANEL. * This correction is necessary to compensate for the length of waveguide between transmitter and antenna. The value of the correction is determined by a method described in the W.E. Instruction Book. These operations can be stated very briefly. PERFORM IN THE ORDER GIVEN. (1) Turn SCAN SWITCH ON C AND I TO LOW SPEED. (2) Turn SWITCH ON SCANNING SWITCH PANEL TO OFF. (3) Turn HV CONTROL ON POWER CONTROL UNIT TO MINIMUM. (4) Turn MAIN SWITCH ON POWER CONTROL UNIT TO OFF. (5) Turn ANTENNA SWITCH ON POWER CONTROL UNIT TO OFF. Upon first turning on the Mark 8 it will be observed that in order to get a strong outgoing pulse the transmitter plate voltage must be turned up to a value that is about 10 percent greater than the value necessary when the equipment is completely warmed up. Then, over the first 20 minutes of operation, as the radio frequency transmitter warms up, its operating point with regard to voltage will change. Also, the radio frequency will change, so that the receiver tuning and range zero must be adjusted. This does not mean that good results cannot be obtained during the first few minutes of operation, but it does mean that rather frequent adjustments are necessary in order to get best results. After the first 20 - 30 minutes the equipment reaches equilibrium, and requires only infrequent adjustment. Although the intensity control is a screwdriver adjustment, individual operators may have certain preferences. If the intensity is turned too high, there is a considerable loss of contrast, and target echoes disappear in a hazy background. Likewise, beyond a certain point, the sensitivity control accentuates the background static and grass, and makes weak echoes more difficult to distinguish. For best operation, both the sensitivity and intensity controls should be turned back and forth alternately until a satisfactory balance between noise and signal strength is found. 9. A general idea of methods employed in obtaining and interpreting data has already been given in the section on Data Presentation and Interpretation. Solution of the fire control problem for a surface target requires such accurate determinations of range and bearing, however, that those instructions will be continued here. (1) At High Speed Scan turn the Range Unit Crank until the Range Line just touches the echo pip on the short range side. The reading of the Counter will then be the range of the target in yards. At Low Speed Scan, first press the STOP control on the Scanning Switch Panel when the pip is maximum size. Then turn the Range Unit Crank until the step just touches the pip on the short range side. Again, the reading of the Counter will be the range of the target in yards. A switch (ring type) on the knob of the Range Unit can be used to signal plot when the target is accurately ranged. (1) At High Speed Scan, when obtaining fire control data, the trainer trains the director on the target by centering the echo on the center bearing line of the Train Indicator. 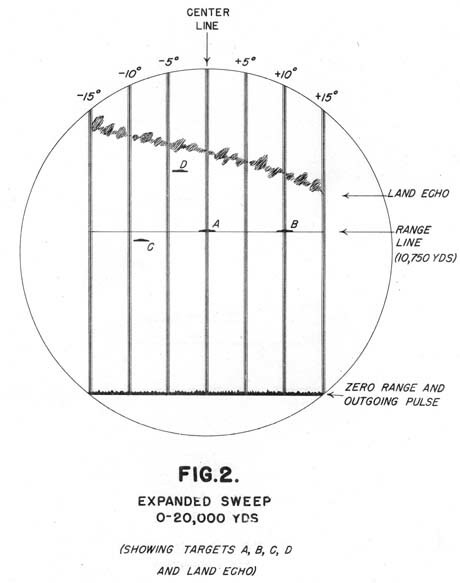 The radar bearing is then zero and the bearing of the target is the same as though the director were optically trained. To get the bearing of another echo, not on the center line, differences can be estimated, with the aid of the 5° bearing lines, and added to the director bearing. The sign of the difference (whether to right or left of center line) must be taken into account. Thus, if the director bearing is 90° in figure 2, the bearing of A is 90°, that of B is 100° and that of C is 82°, approximately. read on the Scan Position Indicator. Depending on whether the reading is right or left, this angle is added or subtracted from the director bearing to give the bearing of the target. 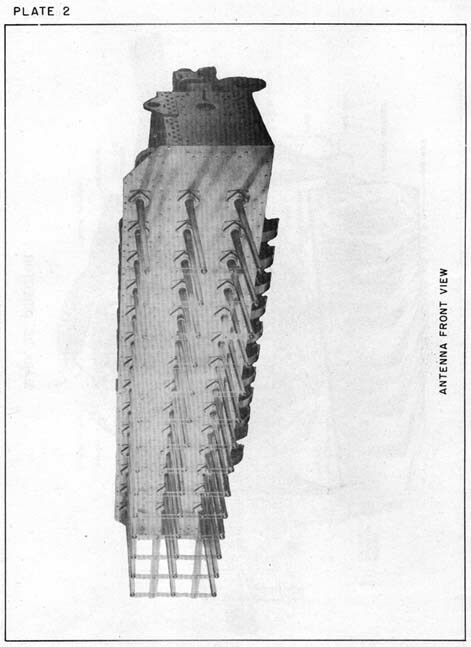 An inexperienced operator on the Mark 8 Radar will generally get the impression, as stated before, that the ship is broadside to the line of sight because of the suggestive appearance of the echo on the screen. The operator must carefully guard against this false interpretation, since it could easily result in a badly confused picture of the tactical situation. The explanation for the fact that all echoes have elongated forms is twofold. (1) The beam width is 2°, and therefore, any target that gives a strong echo will appear at least 2° wide. (2) The range resolution is about 50 yards and any target will appear at least that width. There are cases, however, when it is possible to make an estimate of the target angle. When a large ship is being ranged upon, it is frequently possible to see that the target extends over a considerable range interval, and that the signals at different ranges are at slightly different train angles. For some reason this extended target appears broken up, as though there were several elongated echoes approximately tangent to one another. When this is the case, it is possible to consider the group of echoes as a whole and then make a very rough estimate of the target angle. When observing with the main and expanded sweeps at high speed scan, it is sometimes possible for the range line to conceal an echo. It is therefore a good policy to occasionally shift the range line when examining the screen for an echo. 10. A few notes on performance are given below. Large buoys 5,000 to 10,000 yards. 16-inch splashes at 20,000 yards were observed on type B scan with both EXP and PREC Sweep. Interference from other radars is not particularly bothersome to the Mark 8. No pickup was experienced from the SC or FD radars or from any power units, but the SG with the same type of oscillator produced a coarse network of small dots that constantly shifted its position. Range and bearing accuracy were not materially affected by this pickup. Fading of signals on the Mark 8 is not troublesome at short or medium ranges but becomes quite apparent near the maximum ranges for which the target can be perceived. the field of view. Then, training about still further, an echo will again appear at about 5 degrees from the trailing edge, and at the same range as originally. Just as this echo is disappearing at the trailing edge, the true target will appear on the leading edge and again will be at the same range. This echo, of course, will not disappear unexpectedly as the director is trained about a bit further. 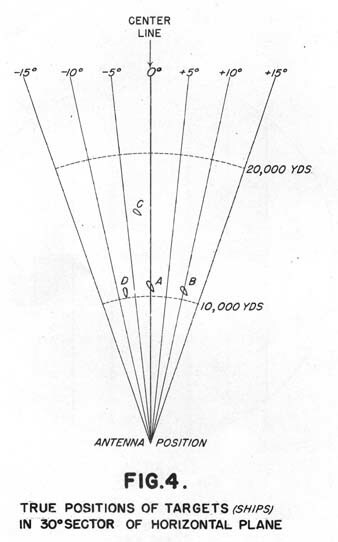 Unlike the experiences with the Mark 3 (FC) and the Mark 4 (FD), it has not been possible to observe multiple reflections from a target at 1,000 yards, thereby giving echoes at 2,000 and 3,000 yards also. Notification of any desired changes in the above distribution should be forwarded directly to the Bureau of Ordnance. 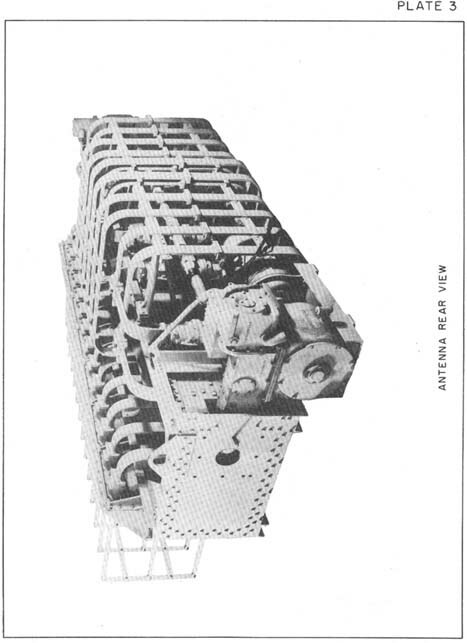 Requests for additional copies of this Ordnance Pamphlet should be made directly to Naval Gun Factory, Washington, D. C., the Navy Yard, Mare Island, California, or Navy Yard, Pearl Harbor, T.H.